Grammar books will teach you how to build the French tenses, and how to use them, and this is essential. But books seldom teach pronunciation, and students end up butchering French verbs; even if you learned with audio, you learned “classic” pronunciation, not the modern glided one used in today’s French. And this too is essential to understand French people when they speak, and for them to understand you as well. With so many different conjugations, it’s really hard to come up with the correct verb form in a conversation. Because my drills are based on repetitions and a practical exercise section, you’ll build up reflexes and never hesitate again when looking for a verb form. Load them up on your iPod and you can drill in the car, at the gym, while grocery shopping… Each drill is 6 minutes long: even the busiest of schedules can find the time to drill – no excuse! And you’ll notice your progress immediately. Start training now! We’ll send you your downloadable products as soon as you place your order. 100 drills + 6 minutes per drill + 217 page transcript + 100% money back guarantee = incredible value! 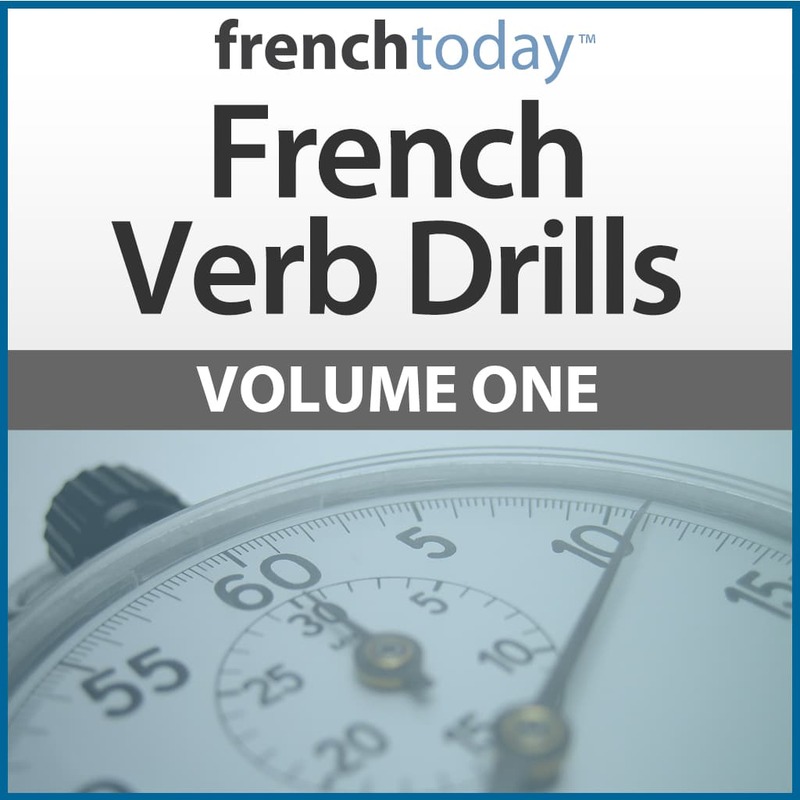 Between learning the rules of conjugation, and seeing them in context, these three volumes of French Verb Drills are perfect addition to increase your confidence and speed in recognizing and using various tenses. It’s not just for intermediate learners… beginners can benefit from these by making a playlist of the tenses and verbs that they are studying. (For example, reviewing verbs in just the present affirmative). Camille and Olivier have put a huge amount of work into this product, and it’s well worth adding it to your studies. 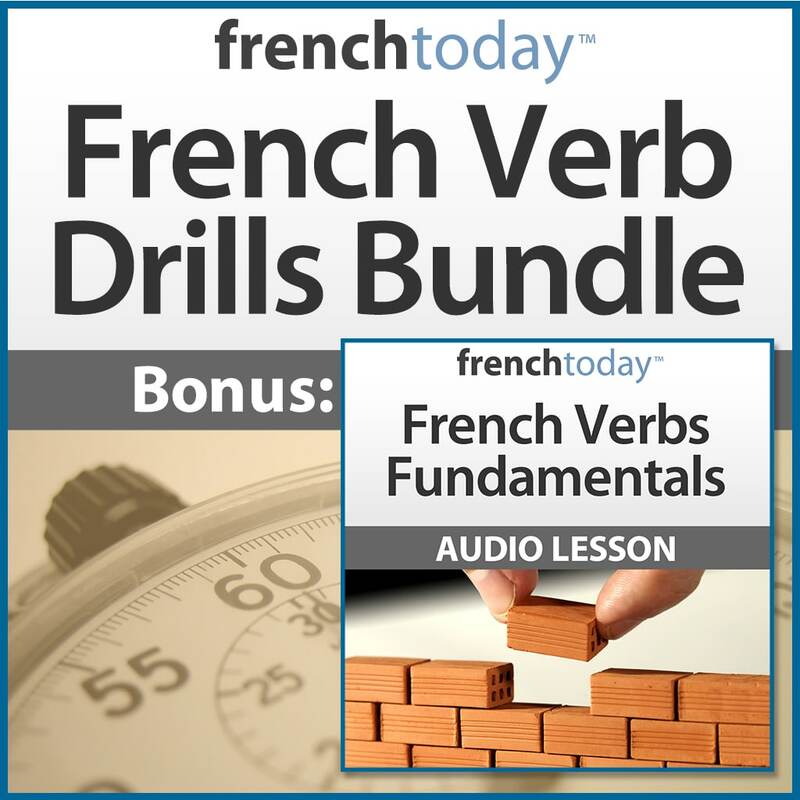 Bought the Verb Drills Bundle and Secrets of French Pronounciation to brush up on my long forgotten schoolboy French. Found them to be clear, concise, and very easy to understand – especially the thorough explication between book and street French. Would highly recommend them to anyone. These verb drills are fun and effective. I play them in my car as I drive. The more one hears the drill, the more their pattern sticks in the mind and it helps with pronunciation! I highly recommend this product, thanks Camille. 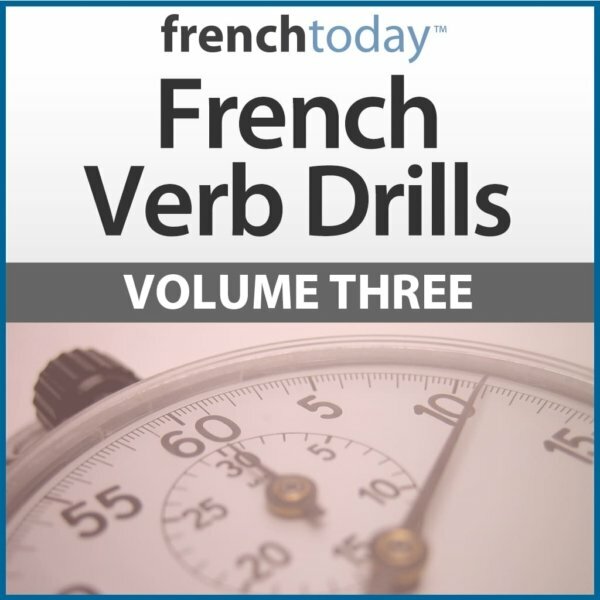 I will soon be in France for 3 weeks, volume 3 with the most useful verbs to conjugate has been very helpful for me! Thank you Camille for these exercises with the modern glidings (so appreciated!) I have loaded them on my iPod and then listen to them while I am on a run, or any time I am near my laptop, or in my car, repetition really is the key!